Sedona Real Estate: New listings for Sedona for Friday started at $269,000 for a Sedona Short Sale Condo with 2 bedrooms, 2 1/2 baths and a fireplace in a popular West Sedona complex with a pool, on up to $664,000 for a 3 bedroom, 2 1/2 bath Sedona Home for sale in Oak Creek Canyon. My pick for today however is a Sedona Short Sale home in a desirable West Sedona neighborhood with cherry hardwood floors and upscale details, high ceilings and Red Rock views for $440,000. Sedona Vacant Land had a new listing in West Sedona as well, and $249,000 gets you a level easy-build 1/3 acre lot with very good Red Rock views. Verde Valley Real Estate: New listings started at jsut $47,500 for a Rimrock AZ Foreclosure home for sale on almost 2 1/2 acres. This is a nice manufactured home with detatched garage and horses are permitted. The high end for the day was $79,900 for a Cornville AZ Foreclosure home. It is site-built and has two bedrooms, 2 baths, 2 car garage and a den. Buyers got lucky with 13 price reductions spanning a wide range of price points and Sedona and Verde Valley locations, from just under $80,000 for a Cottonwood Short Sale home with 3 bedrooms, 2 baths and a fenced yard to under $712,000 (less than $131 per sq ft) for a sprawling one-level West Sedona Short Sale. BUYERS: REQUEST A LIST OF ALL SEDONA & VERDE VALLEY SHORT SALES AND FORECLOSURES FOR SALE. *Buyers and Sellers when dealing with Sedona Short Sales or Sedona Foreclosures, make sure your agent is experienced and has closed these types of sales before. Do they have special training? The CDPE (Certified Distressed Property Expert) designation is the most advanced training available for agents working with distressed properties. As is often the case in life, there are no guarantees, but you can greatly improve your results by working with an agent with a proven track record in closing Short Sales and Foreclosures. A Short Sale is not the best option for every seller, your circumstances are unique to you. Learn about ALL of your options. SELLERS: there is no charge for a consultation, and all brokerage fees are paid by the bank out of the proceeds at closing. RE/MAX Sedona and Move2Sedona are not associated with the government and our services have not been approved by the government or your Lender. If you stop paying your mortgage you could lose your home and damage your credit. Your Lender may not agree to the change of your loan and/or a Short Sale.With a Short Sale, there are no guarantees offered and we cannot provide legal advice. Seek legal advice. Sedona Real Estate: 2 new listings for Sedona Homes for sale for this day include a fabulous true adobe brick Mexican Hacienda style home with guest house on almost 4 3/4 acres for $2,950,000, and a contemporary style home perched high on a hillside with panoramic views of Sedona's red rocks for under $500,000 (owner may carrry). Equally excellent panoramic red rock views are available from this newly listed Sedona Vacant Land opportunity if you'd like to build your own dream home, offered at $310,000. Verde Valley Real Estate: a Cottonwood Short Sale for $105,000 offers 4 bedrooms, 1 3/4 baths, a fenced yard and convenient location. A newer manufactured home in Lake Montezuma is worthy of mention as well, as it has 3 bedrooms, 2 baths and is on over 1/2 acre with lovely mountain views. A healthy crop of price reductions across the Sedona and Verde Valley markets should make buyers happy. Highlights include a Cottonwood Ranch Short Sale 3 bedroom/2bath home now reduced to $155,000 and a huge 3 bedroom/ 3 1/2 bath Verde Santa Fe Short Sale home in one of the gated neighborhoods is now down to $279,000. There were a number of price reductions in Sedona and the Village of Oak Creek, in price ranges from the mid $300,000's on up to almost $800,000, so there's probably something for every pocket. If you're a buyer watching real estate in the Sedona or Verde Valley markets, I can set you up with a web page where you can track only those areas, home types and price ranges that interest you. This information is real-time unlike that on most of the well-known real estate websites like Realtor.com, Trulia.com & Zillow.com (this means it comes directly out of our MLS and will show an accurate status at all times - the big aggregator sites pull information from our MLS anywhere from once a day to once a week, and for some reason aren't very good about accurately reflecting price and status changes). Request a Client Portal website to follow your favorite Sedona and Verde Valley properties. The hours are 10:00 - 4:00. KAZM radio station will be there from 11-2. The Band will be there at 2:00. Ribs from Nick's West Side will be served from 11-3. Please come join us-it's a great excuse to schmooze! Feel free to bring a friend. If you need directions, please feel free to call us at 928-284-4166, or if outside Sedona, Toll Free 800-282-4166. Looking forward to visiting with you! Sedona Homes for Sale: new listings ranged from $375,000 for a one-level townhome in a Sedona Golf community with 2 bedrooms, 2 baths and a den, on up to $875,000 for a Sedona Luxury home with 3 bedrooms, 3 baths, and a 3 car garage on almost 8/10 of an acre, with gorgeous red rock views. This home borders Coconino National Forest land, an enviable location. Also notable is an unusual Sedona home with guest house and an "Old Sedona" feel in a rural setting in the Red Rock Loop area for $439,000. Verde Valley Homes for Sale: new listings started at $77,900 for a nice 3 bedroom/2bath Cottonwood Foreclosure home with fenced back yard, on up to $450,000 for an unusual Cornville home for sale on an acre that could be residential or limited commercial (most recent use was as an assisted living center). Sedona Homes for Sale: New listings include a Sedona Short Sale townhome in an upscale West Sedona community for $349,000. It is one level with high ceilings, 2 bedrooms, 1 3/4 baths and red rock views. For buyers looking for a Sedona 55+ Active Adult home there is a new listing just outside of West Sedona. $227,500 buys you a roomy 2 bedroom 2 bath one-owner manufactured home with a studio/work shop on just over 4/10 of an acre. For information on other 55+ Active Adult communities in the Sedona area, Contact Beth. Verde Valley Homes for Sale: My pick for Tuesday's bargains is a Cottonwood townhome for sale for only $58,000. It is bank-owned (a foreclosure), has 2 bedrooms, 1 bath, covered parking, all appliances, and is stucco with a tile roof. If you're in the market for a Cottonwood condo or townhome, there are also other temptingly priced choices, thanks in part to this day's healthy crop of price reductions. Sedona Homes for Sale: Monday's new listing entries start at $239,000 for an adorable remodeled 2 bedroom, 1 3/4 bath cottage near hiking in West Sedona, on up to $749,000 for a huge one-level Sedona Short Sale home in West Sedona with 4 bedrooms and 4 baths. At this price, it's under $138 per square foot! Sandwiched in between are two more properties that offer unusual opportunities: #1) an acre and a half of land (probably splittable, to be verified with city) in the heart of Sedona with irrigation rights and a quaint 1959 home for $325,000; and #2) an older home needing updating but with an exceptionally nice location at the back of an upscale subdivision near National Forest on 8/10 of an acre. It affords excellent privacy and views. Well worth a look at under $470,000. Verde Valley Homes for Sale: How about $44,000 for a singlewide on stemwall in Rimrock AZ with fenced yard (owner may carry)? There's also an opportunity to buy a Clardale commercial parcel for $249,000 (highway frontage-and it's splittable)! Sedona Real Estate: No new listings in Sedona for Mother's day, but there were price reductions across a wide variety of areas and price ranges across the Sedona & Verde Valley area, from $54,900 (in Cottonwood) way on up to $3,200,000 (West Sedona). The hightlights included a custom Verde Santa Fe Foreclosure home backing Coconino National Forest land for $272,000, a Camp Verde Foreclosure home on 3/4 acre for $126,000, and a quality-built West Sedona home with 3 bedrooms and 2 1/2 baths now under $300,000! Verde Valley Real Estate: New listings for Mother's Day: If you've always dreamed of owning a Bed & Breakfast Inn, the area's longest-running B&B is now available. Owner may carry. There were also 2 new Verde Valley Luxury Homes on irrigated acreage in Cornville and Camp Verde, and a bargain-priced singlewide mobile in Rimrock AZ. Sedona Real Estate: Newest Sedona Home for Sale is a rare opportunity to own a 1960's Sedona Vacation Cabin in lovely Oak Creek Canyon. The perfect cool vacation spot, and offered at $270,000. Imagine the memories your family can make here! Price reduction on Sedona Foreclosure Land, now just $77,000 for a level 1 acre parcel in the Red Rock Loop area-horses welcome! Verde Valley Homes for Sale: 2 new listings, both 3 bedroom/2bath approx 1600 sq ft, with fenced back yards. One is a Cottonwood Short Sale and is an older home in a good neighborhood with a 2 car garage and RV hookups. The other is a newer Cottonwood Home for Sale for $146,000 with 2 x 6 construction and modern amenities. It is a 'traditional' sale. Sedona Real Estate: If you appreciate dramatic Contemporary styling and superb Red Rock views, this Sedona Home for Sale in the upscale Palisades area is now an excellent buy at under $600,000. Verde Valley Real Estate: If you need elbow room, you are in luck! These 3 Verde Valley Homes for sale all represent excellent value with varying combinations of good square footage and large lots: 1) Cottonwood Short Sale home with 4 bedrooms, 3 baths, almost 3,000 sq ft and on about 1/3 acre for $170,000; 2) Cottonwood Foreclosure home with 3 bedrooms, 2 1/2 baths and almost 3200 sq ft on over 4/10 of an acre, Santa Fe style with distant mountain and red rock views for $195,000; 3) Cornville Horse Property with pool on 2 1/2 acres with 3 bedrooms, 2 1/4 baths almost 2800 sq ft and reduced to $339,900. Interested in knowing more? Click here to contact Beth Larsen, RE/MAX Sedona. Sedona Real Estate: New entries for Wednesday started out at a very reasonable $250,000 for a rare Uptown Sedona condo backing National Forest land on up to a cool $3 million for a Sedona Luxury Home on an incredible 2 acre parcel on the cool waters of Oak Creek, with really cool views of world famous Cathedral Rock. 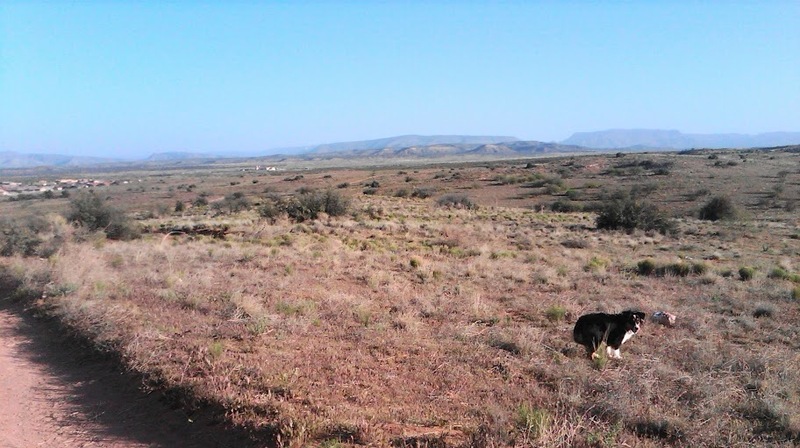 Verde Valley Homes for Sale: The starting point here is $85,500, which will buy you a nice 2005 3bedroom/2 bath Rimrock AZ home. 10' ceilings, jacuzzi in the master bath, 2 car garage and room to park an RV. Not half bad! Want to learn more? Click here or call Beth at 928-284-2501. Sedona Real Estate: Sedona Homes for Sale on the market for Tuesday started with a newer West Sedona condo for $345,000, on up to $2,449,500 for a Sedona Luxury home, a contemporary Tuscan-style Villa with a pool, sited high on the banks above Oak Creek, with panoramic Red Rock Views including Cathedral Rock. This exquisite property is located in the Red Rock Loop area just a short drive outside of Sedona, near Red Rock State Park. It's just about 15 minutes into town, but feels like it is worlds away. Also notable is an Uptown Sedona Home for Sale perched high on a ridge. It is a quality built older home with good bones. It is in very good condition but could use some updating-and is well worth it, with 360 degree panoramic views of most of Sedona's most famous red rock monuments. It is also within a short stroll of restaurants and galleries. For those that enjoy an in-town location, Uptown Sedona is unparalled. It is offered at $799,000. A new Sedona Vacant land listing is also worth mentioning: at $254,900 for over an acre and located in a prestigious gated subdivision in Sedona's Chapel area with gorgeous red rock views, it represents a solid investment in Sedona's future. Sedona Homes for Sale: Monday's new entries for Sedona start at $419,000 for a 3 bedroom, 3 bath home on over half an acre in Pine Valley, on up to $549,000 for a remodeled West Sedona home with a bit of Hollywood in its past, quality finishes, and a rooftop deck with great red rock views. Verde Valley Homes for Sale: Started at a modest $59,000 for a 3 bedroom, 1 bath home on about 1/4 acre near a pond, and ranged on up to $78,000 for a 3 bedroom, 2 bath on about 2/10 acre. If you've been following my postings, you're probably starting to realize that once you get outside of Sedona, prices can be MUCH lower. Of course, this is only one day of market updates, and there are exceptions to every rule, but I just wanted to give you an idea of the wide variety available in regards to not only price but what you can get for it in the Sedona and Verde Valley area. Sedona Real Estate Market Statistics for Sunday, 5-1 2011 - Happy May Day! 24 Hour Real Estate Update for Sedona and Verde Valley Real Estate. Cottonwood real estate had the notable listings for May day, with a large Cottonwood Home for sale with a rare large (3000 sq ft) guest casita almost as large as the main home. This country estate property sits on Cottonwood Greenbelt acreage with grandfathered-in irrigation rights. It is gated, has lovely custom finishes and no shortage of outdoor living and entertaining areas. It is offered at $849,000. If that's too rich for your blood, there is a very nice newer 3 bedroom/2 bath Cottonwood home for sale offered at just under $200,000, with stucco exterior and tile roof. 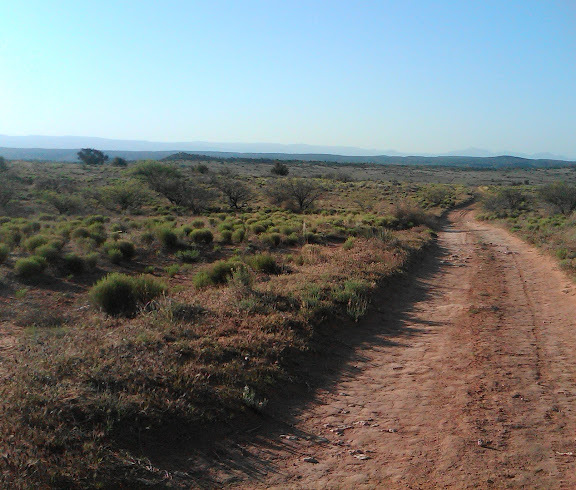 One thing I definitely love about living in the Sedona Verde Valley area is the absolute ease with which one can find a trail with nobody in sight for miles and miles and just leave the everyday world behind. These photos were taken early in the morning. I had forgotten my camera but had my trusty BlackBerry. The trail is easily accessed from the golf communities at Verde Santa Fe in Cornville AZ, and is just one of many in the area that offer access to literally hundreds of acres of National Forest Service Land surrounding this Master Planned community in Northern Arizona. The location is very convenient to all that Sedona and the Verde Valley have to offer: 15 minutes to West Sedona, 5 minutes to Cottonwood AZ, about an hour to Flagstaff and Prescott, and an hour and a half to North Scottsdale and the Phoenix Metro area. In the scene above, we are looking northwest towards Verde Santa Fe and the golf course, with Cottonwood AZ in the background, and the historic mining town of Jerome AZ perched on Mingus Mountain in the distance (look just a little left of center, on the taller mountain). At night it's a gorgeous sight too, with the sparkling lights echoing the stars above. The view below follows the road across miles of Coconino National Forest land (though this is located in Yavapai County-go figure), towards the Oak Creek greenbelt area of Cornville to the southeast. 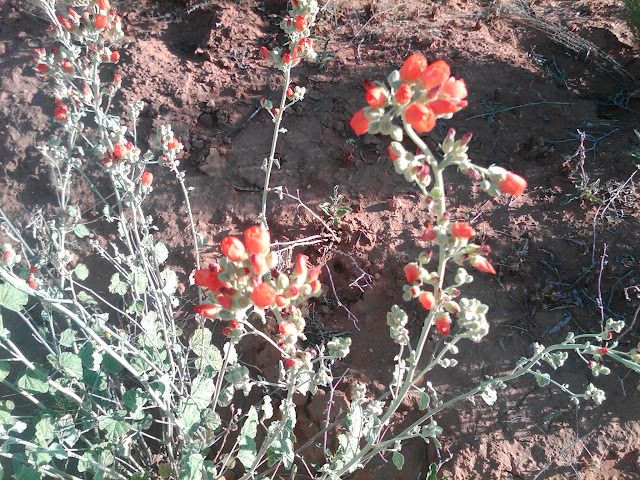 Wildflowers along the path - this orange beauty is Globe Mallow. Looking back towards the Red Rocks of Sedona. My friend Bella loves a good hike! There's no doubt that this is a powerful and serene way to start your day in Yavapai County AZ in Northern Arizona! For more information about the 7 neighborhoods of the Verde Santa Fe, visit www.VerdeSantaFe.info. There are gated and non-gated neighborhoods, and 55+ Active Adult Living as well. To search for other areas in Sedona and the Verde Valley, visit www.Move2Sedona.com, or Contact Beth Larsen. You can also pick up the phone and reach me at 928-284-2501. Sedona has long been known as a haven for artists and creative types in general, and Saturday's pick is a perfect embodiment of this idea: it is quirky, distinctive and just plain fun. It's also on almost an acre with outstanding privacy and red rock views. So if your inner artist wants out, come see this $459,000 Chapel area retreat. For questions about this or other unique Sedona Homes for Sale, click here. If you're looking to buy on a budget, you can't do better than this great Cottonwood Foreclosure Home-it's a large 3 bedroom 2 bath home on almost 1/4 acre for just $114,900. It's a great time to buy dirt too: most of Saturday's new listings were Verde Valley Vacant Land for sale. Choose from several different 2+ acre parcels for just $24,900, or buy the whole parcel-almost 8 1/2 acres for just $49,000! 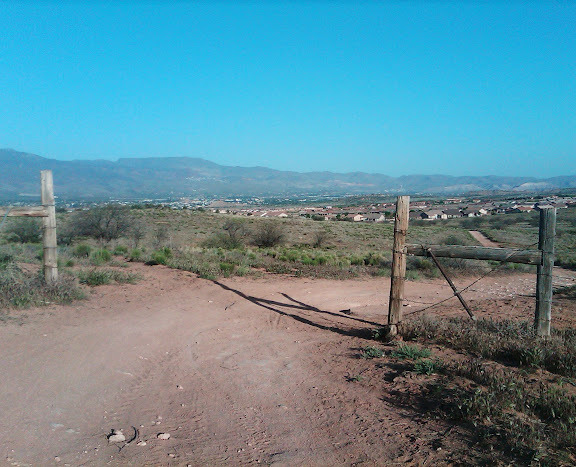 Sedona Vacant Land: Sedona's newest entry is a lovely 2+ acre parcel in an upscale gated subdivision for $335,000. It has panoramic views, and it doesn't hurt that it backs to Coconino National Forest land.